Recently I journeyed to Wilmington, NC to check out the Life Fitness ellipticals trainers at US Fitness Products. Having just tested the Precor Ellipticals, I wanted to compare it to the Life Fitness models. These two brands are the top contenders for the best elliptical trainers for home use. There is no question that Life Fitness builds quality. This particular store also had Vision Fitness. They make good ellipticals, but when you stepped off them and get on a Life Fitness, you’re in a whole different category of excellence. I tested the X1, X3 and the X5. The X1 is quality all the way, but the X3 and X5 models are even better, and it is reflected in the price. 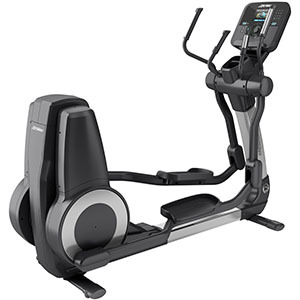 Life Fitness Ellipticals are On Sale! All of these elliptical have an extremely smooth elliptical motion. You can’t believe how quiet they are. There is virtually no noise. All of these machines are rock solid. In fact, the X5 models weigh in at 250 lbs. Make sure when you purchase this machine it includes inside delivery. I talk about the difference between rear and front drive elliptical trainer in the Buyer’s Guide. One of the benefits is the comfort zone of the foot pedals to the handle bars. With some front drive machines you can be unnaturally reaching forward for the handle bars and you may have to reach up. The Life Fitness rear drive machines have the perfect comfort zone for an upper and lower body workout. And for additional comfort, the X5 has adjustable foot pedals. Regarding the durability and the service record of Life Fitness, they are extremely low maintenance. When I talked to the service manager at US Fitness he mentioned on a rare occasion they have to make some minor adjustment due to a slight squeaking noise. Major breakdowns just don’t happen. Many Life Fitness machines come with your choice of console. Here are the options for the Platinum Club Series elliptical. If you check out my “Best Buy” recommendation you notice I give both the Life Fitness X3 series and the Precor 5.18 a best buy rating at the $2,000-$3,000 price range. But in the $3,000+ range I have to give the best buy to Precor for their 5.23 model with the CrossRamp technology and the ability to adjust the incline. But this feature comes at the sacrifice of the upper body workout. You can purchase the Life Fitness ellipticals online at the manufacturer site, but you may want to consider buying through a fitness specialty store. Tell them the price online and they probably will beat it. *Listed as a “Recommended Buy” from a popular consumer report magazine. You can’t go wrong with the Life Fitness elliptical trainers. They are well engineered, attractively designed and are extremely durable. They feel like commercial quality machines. There are two considerations for purchasing a Life Fitness elliptical. First, can you afford it? Second, is a Precor a better choice? If you want both the upper and lower body workout, then it is a difficult choice. Before you decide check out a Precor with the CrossRamp Technology. Customer satisfaction is evident when all 6 ratings for the X3 are five stars. There were a couple of negative reviews for the X5 and the X9, but the majority gave very favorable ratings. 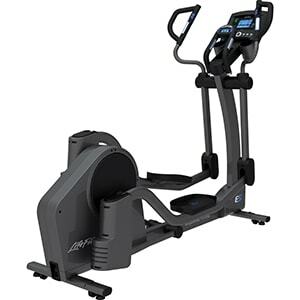 Also see the Life Fitness X-1, Life Fitness X-3 and Life Fitness X-5 Reviews.